Gardening can be a relaxing and rewarding hobby. But sometimes, depending on your choice of crops, you need to keep that hobby under wraps. And that’s where The Server Farm comes in. It looks like a vanilla desktop PC, but instead of electronics, inside you’ll find grow lights, reflection panels, and a compact watering system. 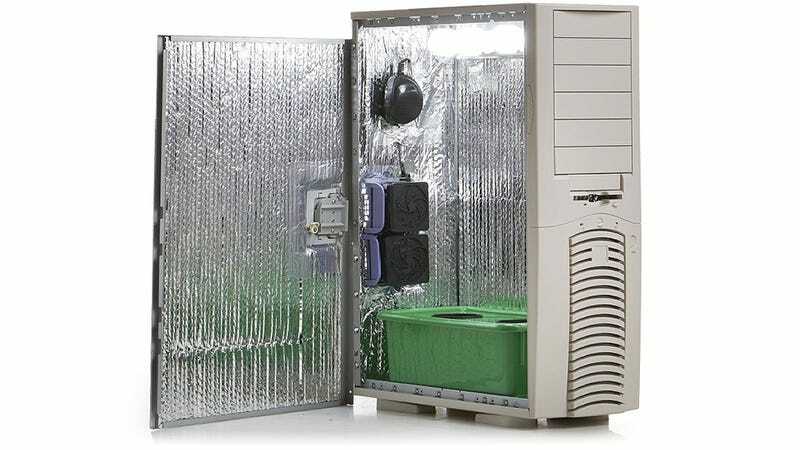 The Server Box actually comes with everything you’ll need to grow a small garden indoors, even in a dark corner of your basement, including a two-year supply of nutrients and a system for eliminating suspicious odors. The only thing it doesn’t come with is seeds, you’ll need to find those yourself. At $695 it isn’t a cheap solution, you can actually build a real PC for that much money. But it does come with one very important feature that totally makes the price tag worth it: insurance that no one will stumble across your crop.